Matthew Pope, who has given interviews to local newspapers in Newcastle upon Tyne, in northeast England, as the official spokesperson of Pediga UK, said the group is protesting the supposed Islamification of Britain. The Facebook group for the first UK rally, scheduled to take place in Newcastle upon Tyne on February 28, shows around 600 people are planning to attend. A number of anti-fascist groups are already planning to resist the march, labeling Pegida UK racist and Islamophobic, at the same time as voicing concerns over violence toward members of the general public. “Unfortunately, we've witnesses a spike in attacks on the Muslim community and I think it's very important that everyone stands out and says that we don't want the Muslim community targeted,” joint secretary of Unite Against Fascism (UAF) Weyman Bennet told Sputnik News. 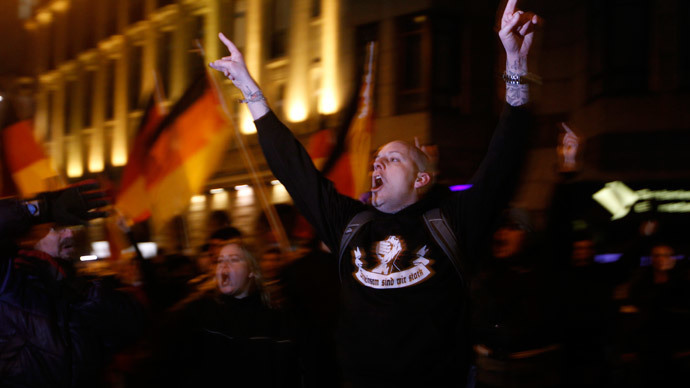 Pegida, which translates from German as Patriotic Europeans Against The Islamization Of The West, has staged rallies thought Germany and drawn thousands to the streets, both in support of its aims and to oppose it. In Dresden, 25,000 people marched with the group, which German Chancellor Angela Merkel has called “full of prejudice, a chilliness, even hatred.” The growing popularity of Pegida mirrors the rise of anti-Muslim feeling throughout Europe, which has seen the rise of neo-Nazis in Greece and the National Front in France. Pope told the Newcastle Chronicle that Pediga UK chose to hold its march in the northeast city rather than London so as not to conflict with far-right “extremist” groups in the capital. “There are a lot of right-wing extremists there and we wouldn't want to associate ourselves with them,” Pope said. He claimed Pediga UK only protests Islamic extremism. However, the activist’s Facebook page suggests otherwise. Pope’s personal account shows he likes other far-right British groups such as the British National Party (BNP), Britain First, the English Defence League (EDL), and Anti-Islam (England Division). In December, Pope claimed he was going to quit the “anti-Islam” movement and focus on Christianity. “I have decided to leave the anti-Islam movement. I am now focusing on Jesus only. I feel the people involved in most of it are in it for the wrong reasons,” he posted on Facebook. “I should be promoting Father’s kingdom instead to promoting hatred (even though that was never my intent). I confess that I spread hate through ‘Ban Islam’ with over 90,000 followers, I should have been more responsible. Since supposedly moving away from the spread of anti-Islam sentiment, Pope has since become involved in the promotion of Pegida UK. He claims the prevailing nationalism of other far-right groups is detracting from the main aim of fighting Islam, however. “I support the anti-Islamic movement. But I do not support groups that emphasize the patriotism. Any group that deliberately draws attention away from the real issue (Islam) is going to fail,” he wrote. “You, like the EDL and Britain First, are just going to be labeled as racist bigots. It's the price for being nationalist. Until people ditch the patriotic side of things the general public will only label you as racist. Pope, who claims to be a qualified mental health nurse, has been unemployed for a number of months. He blames immigration for the lack of UK jobs. He has previously been charged with grievous bodily harm.